A search for fluid and airy spaces that are not rigidly divided but designed to foster feelings of freedom and levity. A lighting design that uses the latest LED technology to accentuate brightness and create aesthetic solutions with great emotional impact. 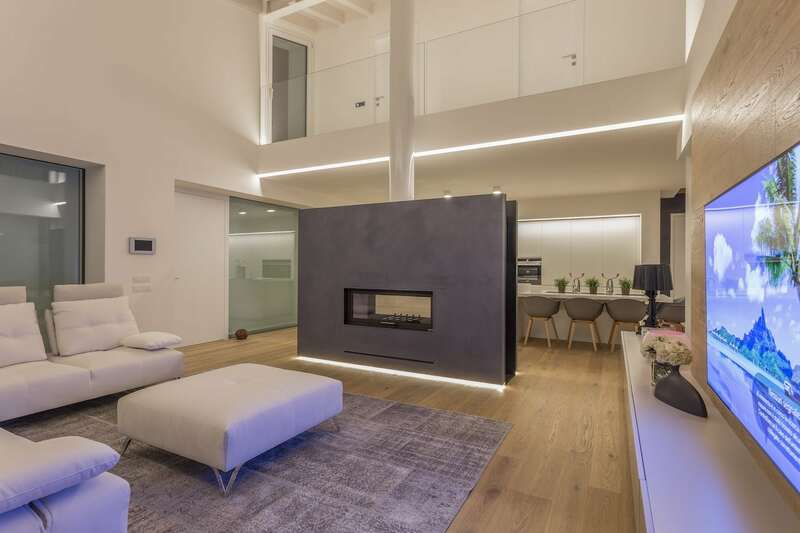 Architect Matteo Munaretto describes the architectural and interior design project for a refined contemporary home. 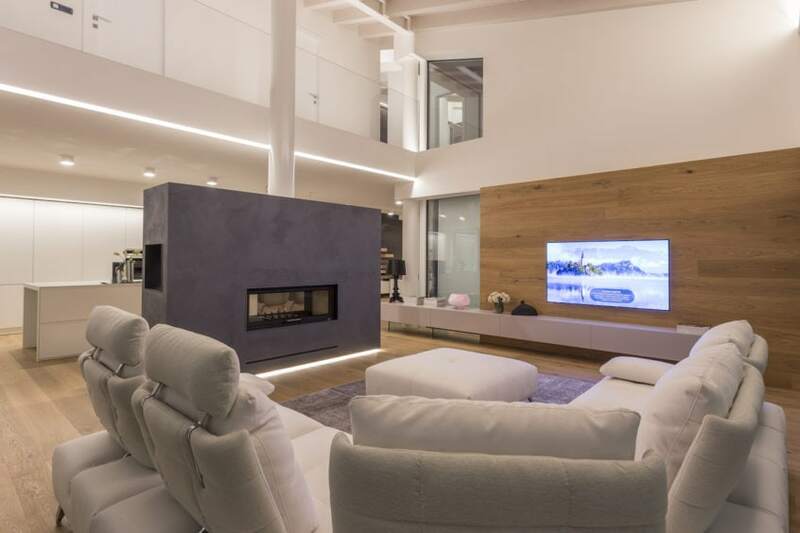 The architectural and interior design project has covered every area of this contemporary home, characterized by dual heights and large and light-filled environments. 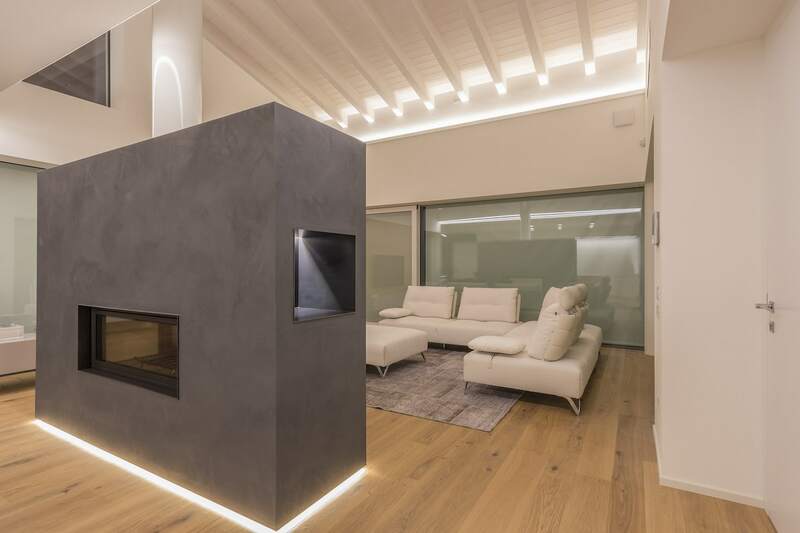 Natural materials such as wood and lava stone are enhanced by large glass walls, which abandon the perception of spatial boundaries between inside and outside. The sloping wooden roof, a suspended yet predominant element, creates a union between the various levels of the home. Spaces are fluid and with no clear distinction between the environments. 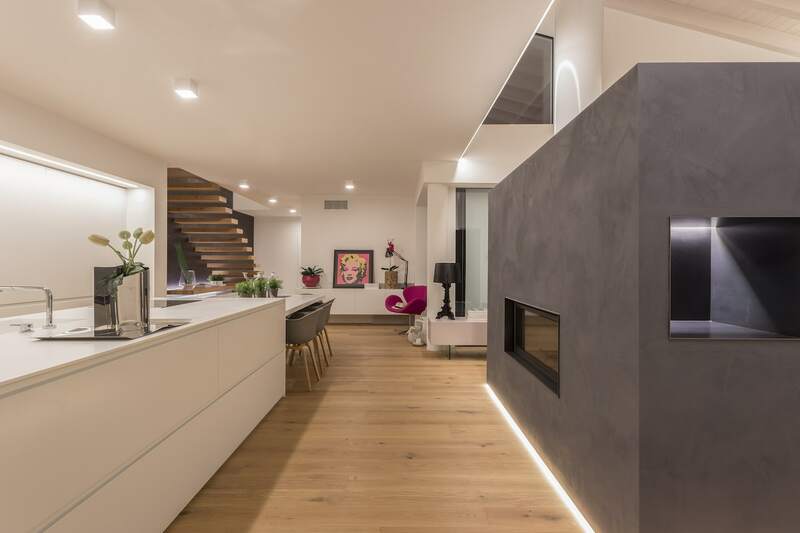 On the ground floor, the central element is the fireplace, which conceptually divides the living area from the dining area, keeping the open space accessible in a circular sense. Architectural intervention is based on contrasts. 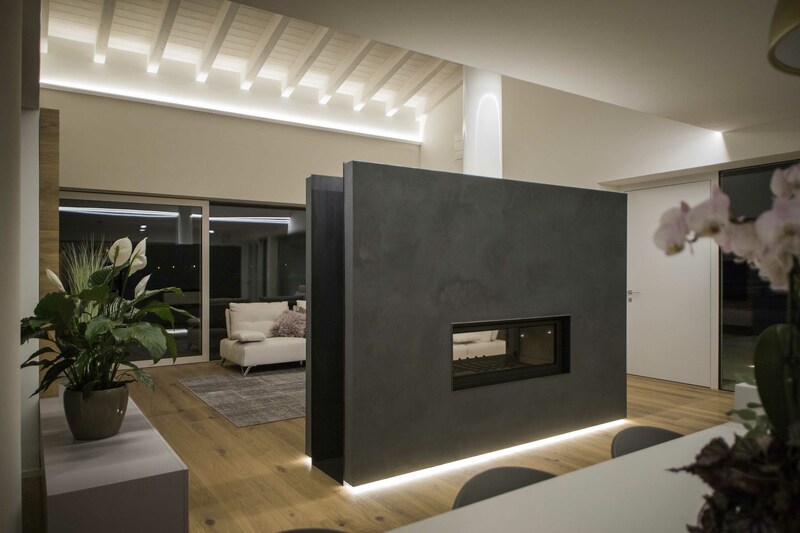 The proportions framed by clean and rigorous lines are enhanced by artificial light, grazing the wall and marking the wooden beams of the roof. Lighting is the common thread between the rooms in the home and guides the user through intense and luminous suggestion. 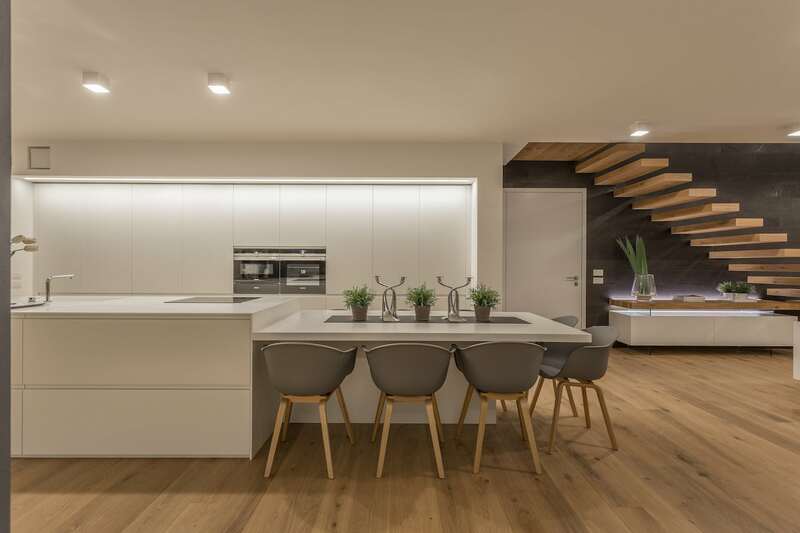 The minimalist kitchen has been designed with elements that grow vertically, incorporating the workspace, appliances and ample storage space, and horizontally with a cooking island. 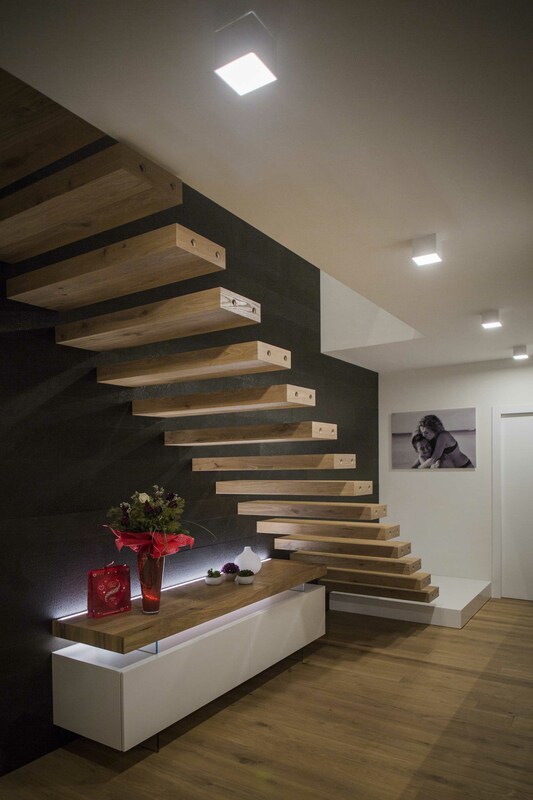 The staircase connecting the two floors of the house was made with monolithic wooden elements, on a lava stone background. It crosses the space with weightlessness, pronounced by a cascade of light enhancing its path. The walkway leading to the rooms and overlooking the living room offers a birds-eye view of the space below. The perception of absolute linearity is emphasized by continuous and integrated light elements. 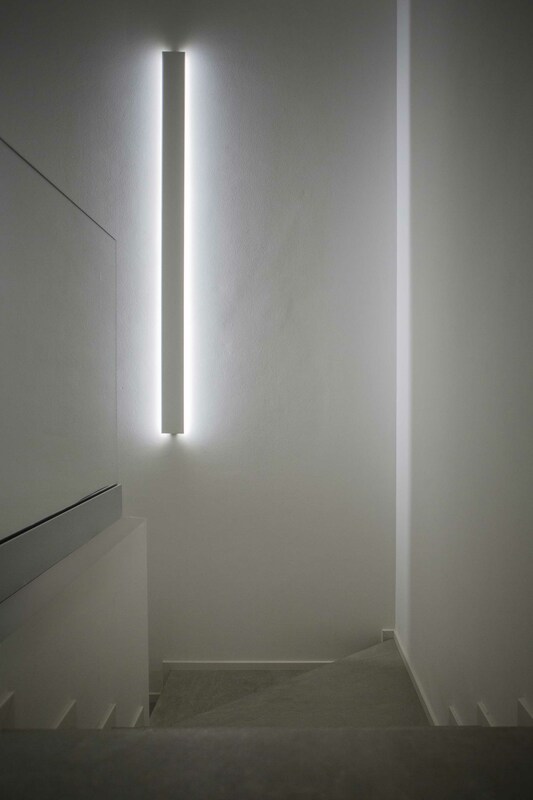 Strips and LED profiles have been designed to create unique and characterizing details. 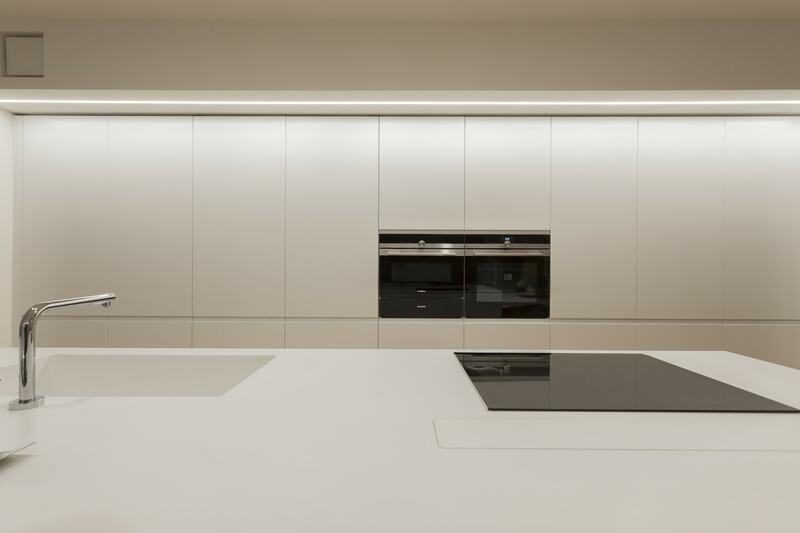 In the open concept kitchen-living room, the custom-made LED profiles are concealed in the wall to project the light towards the ceiling. The resulting light is soft and diffused throughout the environment, to foster a pleasant atmosphere in which to welcome guests. 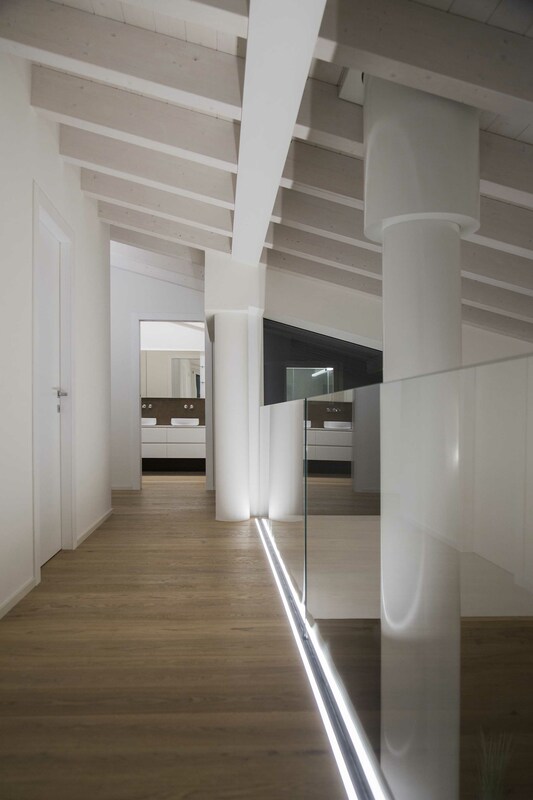 The LED strip on the floor marks the end of the balcony, illuminating the ceiling. In this way, the guests can appreciate the ceiling beams even from the lower floor, sitting comfortably in the living room. 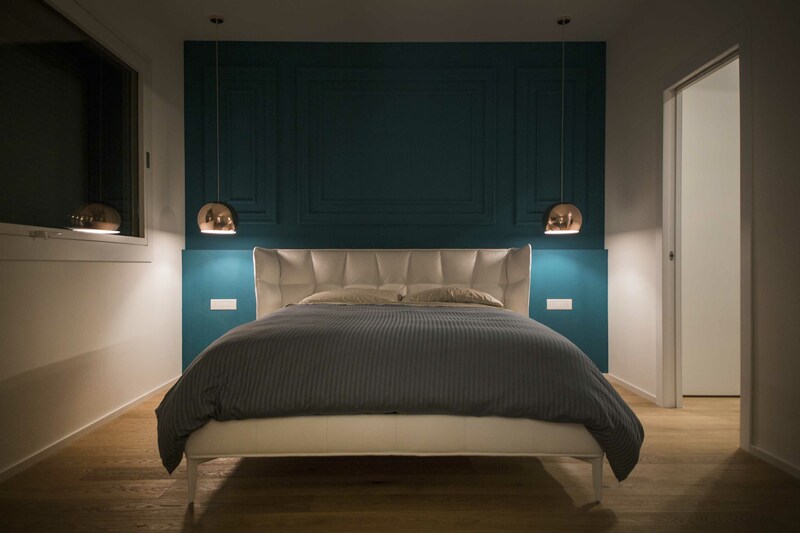 In the bedroom, the Olev Sphere suspensions illuminate solely the bedside tables, for a warm and welcoming night-time light. 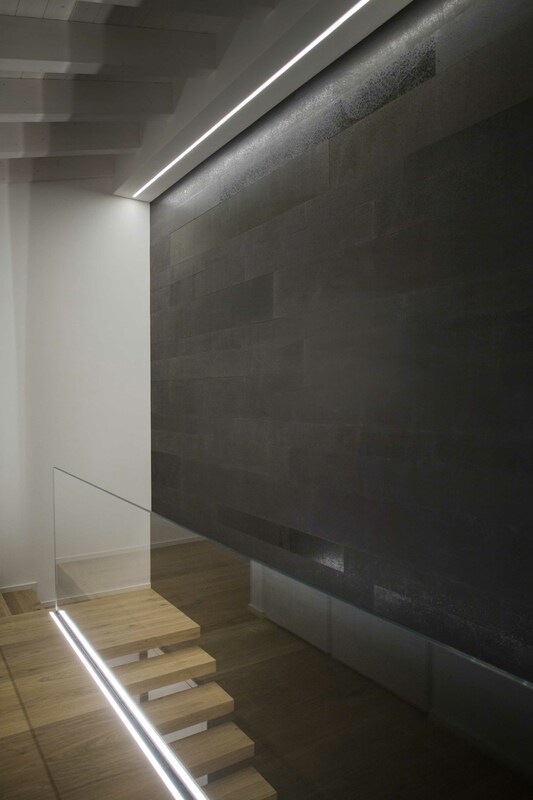 The unique bi-emission profile that illuminates the stairwell is unique and functional. Are you furnishing your contemporary home? Do you want to discover which types of designer lighting fixtures will enhance the style of your spaces and make them brighter? Click HERE and fill in the form to get expert advice from the Olev official resellers.